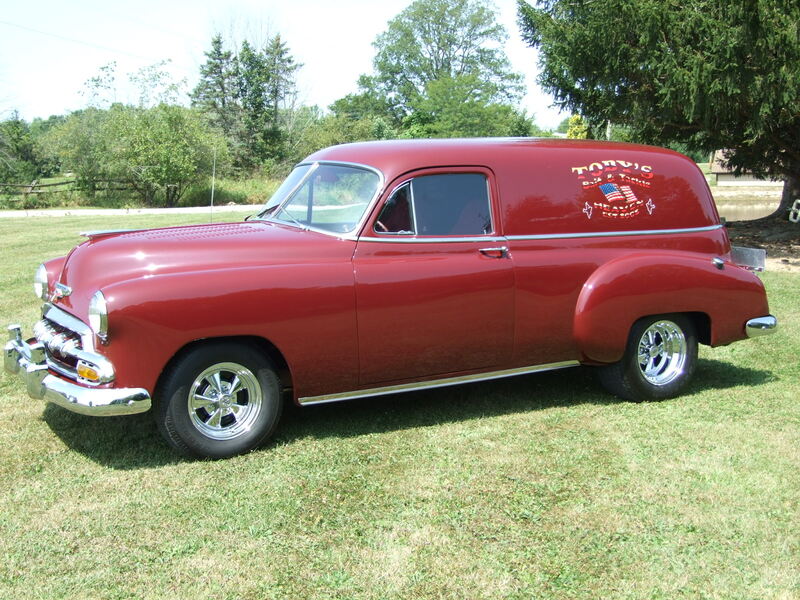 1952 Chevrolet Sedan Delivery 2 Dr. Custom Built Chassis, Corvette Rear End, 350 GM, 700-R4, Laser Straight, Swivel Buckets, Steel Body. Owner collected cars for years. His toys enjoyed an insulated miniature home “Man Cave” style built, air conditioned and heated, complete with billiard table and memorability. Took him five years to finally decide to depart with his final vehicle. Current owner bought Delivery between 2005 and 2006, and owners friend performed all maintenance. Current owner had glass removed, exterior trim totally removed, and reconstructed the enclosed top, and minor repair of lower rear door. The bright work was re-polished before reinstalled. Car has had a full professional repaint done in the same color. * The painting of this vehicle was expertly performed. It is polished as smooth and shiny as you could imagine, and matches all the way around. * We didn’t find any orange peel, and the paint is about as reflective as you could imagine. * The body of the car is beautifully laser straight. * In randomly going around the body with a magnetic paint gauge, and paying close attention to the lower sections(fenders, quarters, and doors) we did not find any areas where we could not find the presence of metal. * Again to expertly prepare this body prior to paint to make it what we would call laser straight it was very carefully done. * There was very little variation in the amount of magnetic pull, so the paint it is a fairly even depth all the way around. * Like most show car finishes its slightly thicker paint than your everyday car, but that is very common with this type and quality paint work. * In closely examining all the bright work on the car, it all seems to be secured properly. * The stainless that surrounds the window areas, and the moldings that go above the door knobs are all very nice and straight. Look close in pictures you won’t see any dimples or issues with it. This is also true with everything around the front and rear windshield, and bright work on the vent windows. * The door handles, taillight bezels, gas cap, hood ornament, lower center section of the grill, antenna, exhaust tips, front bumper, and rear bumper look pretty much of a car just a few years old with just a few light scratches. They are highly reflective, and the chrome is in nice condition. * The headlight bezels and the upper part of the grill are just a shade lower quality condition than those I just spoke of. They show a little more light scratching, and are not as reflective. They may or may not be the same materials. * We don’t see any discoloring, bulls-eyes, cracks, or wiper marks in the glass. * Both the rolling glass on the left and right side has the Safe Lite label. * The left windshield is Duplate, right side windshield and rear window are Safety plate. * Vent windows show no identification. * Though it is not new glass, it shows very little wear at all. 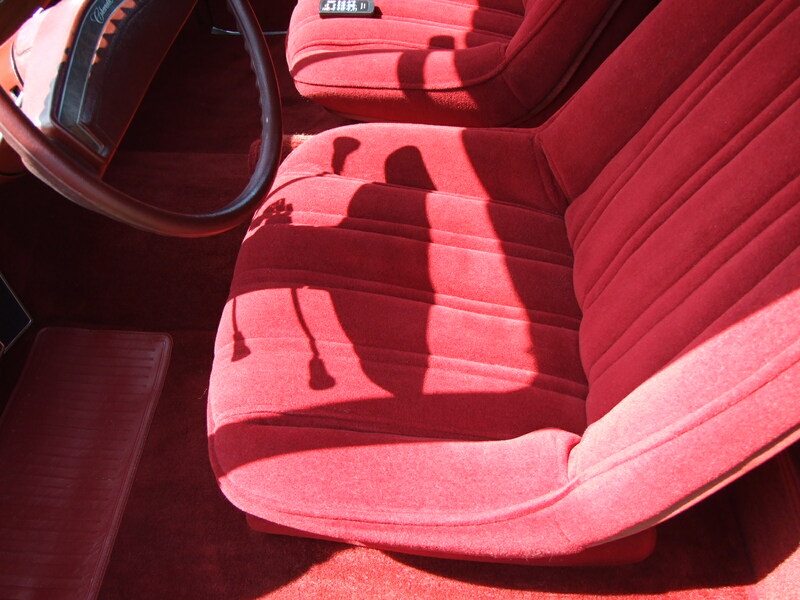 * Interior is all custom done from the headliner to the side panels, seating, carpeting, dash, and wood grain. * Its does not show any wear, it looks pretty much as it would have the day it was completed. * The color is good and rich on all materials, with no signs of fading. * The visors are matching color with good solid backing, with no break down. * The seats are swivel design which is nice and convenient. * The gauges look like new, and so does the radio. * It looks like I would expected it to look the day it was completed, with no wear and great color. 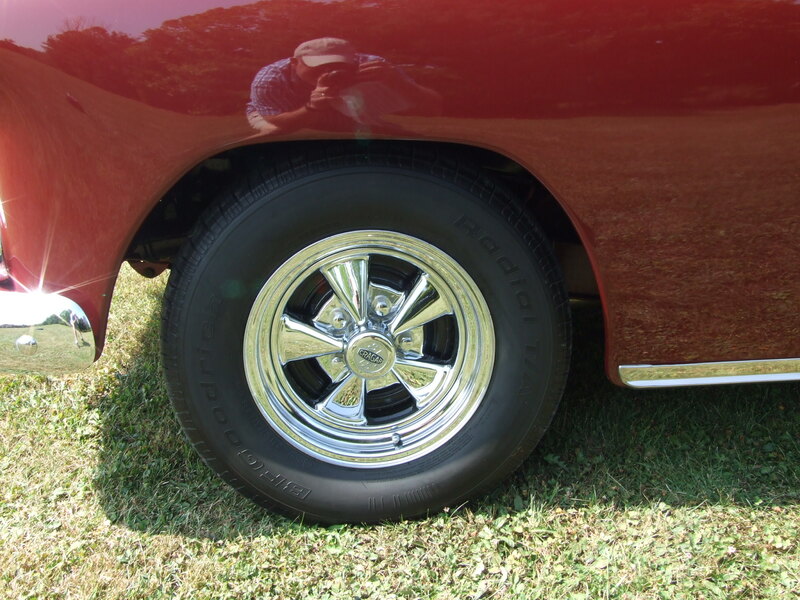 * The owner indicated there is not more than 200 miles on these wheels and tires, and he had purchased them new. He has not driven the cars over 1000 miles since he bought it. * We don’t see any wear or cracking on the tires, and the Cragers (even in around the nuts) don’t show any wear or exposure. * The wheels are in the condition of a car just a few years old or about as close to new as you could expect. * Its obvious that the entire drive train, engine, transmission, and rear end have all been upgraded. 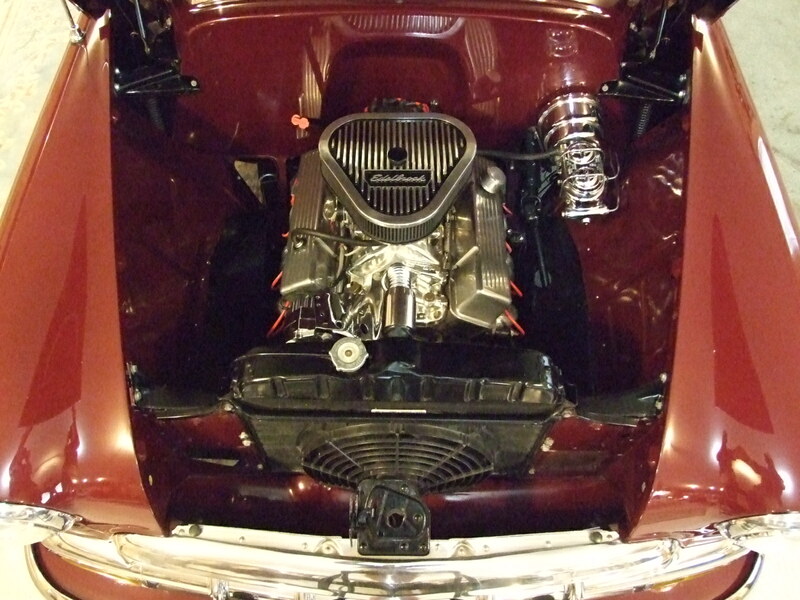 See the nicely polished intake, Edelbrock air cleaner, aluminum and chrome pieces, and the top of the black engine really enhances what we see here. and an electric cooling fan. * Upgraded steering column and mechanism. * Closely review pictures, they will help explain. * The build from the chassis (the foundation) on up has been expertly performed. * This is truly a street rod that was built on top of a foundation of professional work, and upgraded components. * The frame during the built was painted to resemble the exterior of the car, and still contains a very good shine with a couple chips from the rack lifting the car. It has withstood, and is still in very nice condition. * We did not see any rust perforation anywhere on the frame itself. * The floor pan and the rockers all look solid. * There are a few modifications for different drive trains and serviceability, but appears to be solid fabrication. * There where replacement floor pan inserts on the driver and passenger side, please inspect pictures closely to understand. Other than that the floor pan appears pretty much of the original design. * The floor pan bottom side is all painted in a shiny semi gloss black, and again has maintained its coating and color very well over the years. * The rockers are very solid and look mostly untouched, with possibly a little repair on the back at some point. * Car has drop front axle supports and shocks, and drum brakes front and rear. * All the nuts and bolts, and fuel lines that where installed during the build do not have any type of weathering or surface rust, this shows how well the cars has been kept free of the elements. * The engine does not seem to have any type of oil leaking, other than the very normal dampness around the front main. * We didn’t notice but maybe a drip or so from the transmission pan, and the rear end for the most part looks dry. 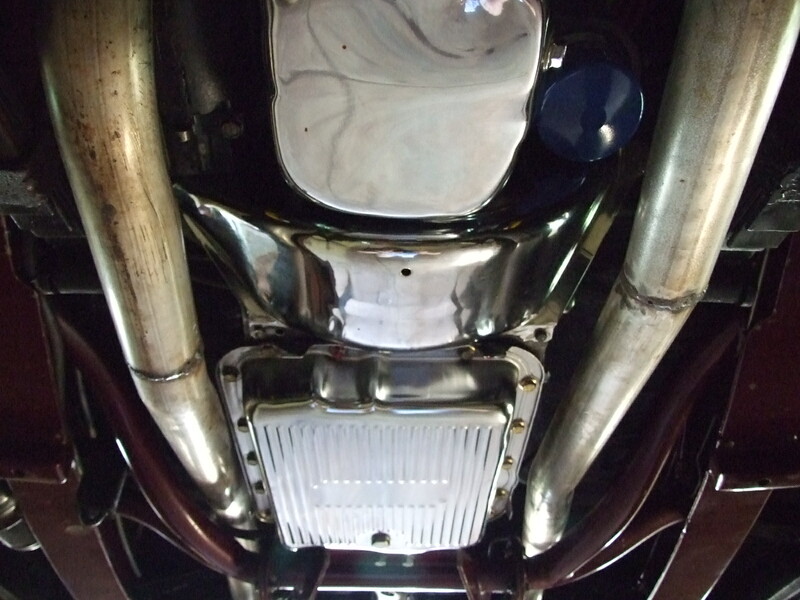 * Custom installation of dual exhaust running totally separate all the way to the rear, and utilizing Flowmaster mufflers. You will notice the custom installation of a fully independent Corvette rear end and suspension, which again has been detailed in black and expertly mated into the frame with custom built suspension components. * The battery is located in the back, and see how beautifully the tank was finished in a gloss black. Chad rode in the car for about 5 miles, and than Chad drove it back approx. five miles to the “Man Cave”. It started very quickly, accelerated, and ran very smoothly. It shifted nicely up through all gears, and appeared to down shift properly. Upon testing the brakes and stopping many times it didn’t pull to the left or the right. The car stopped very straight, and smooth without any pulsation. It steered properly and straight down the road, and felt that the components worked as designed. It seemed very smooth and has a nice exhaust tone like a good quality street rod would have. 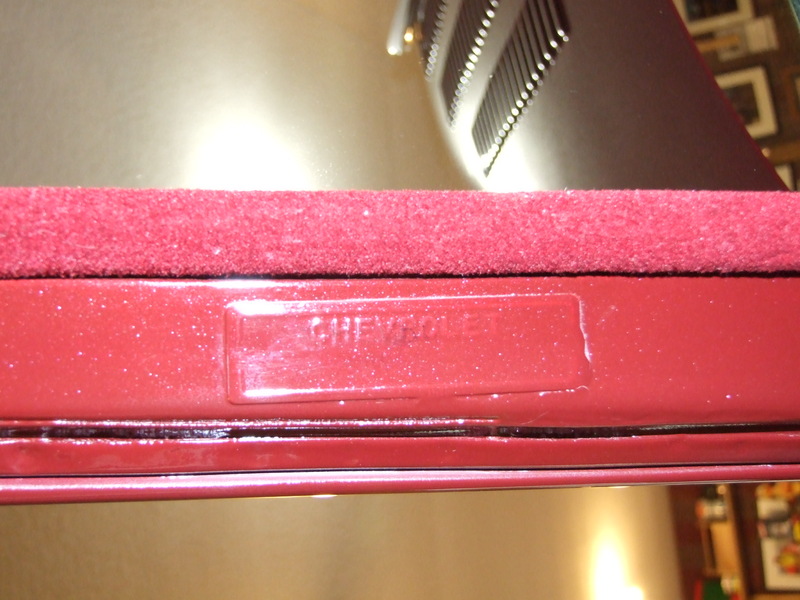 The serial number on the drivers door jamb tag has been painted over, but with a bright flash light on it you can in fact see the numbers, and they appear to match the vin on the title. Our recommendation would be that a buyer upon inspection shines an extremely bright light on it to see. If there is any questions of concern in the titling process they can remove the paint at their choice. Model Sedan Delivery 2 Dr.